The Saturday Evening Post Illustrations by Norman Rockwell - Spiral. Nostalgic images provide a snapshot of how life was years ago in this 13-month calendar. Price good till May 31, 2019. Minimum quantity 150. Quantity variation +/- 4% is possible & billable. 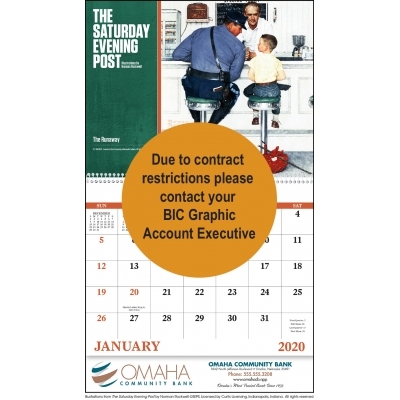 13-Month Appointment Calendar. All styles include December through December, unless otherwise noted. The last month prints on the inside back cover. The cover is UV coated. Enjoy 12 full color pictures. A new picture is shown each month. Size of calendar: 10" x 10" closed; 10" x 19" open. Envelopes. See pull-down menu for pricing. Halftones (Black & White photo reproduction): $22.00 charge for each halftone reproduced in the ad. There may be additional charges to touch up photo. No charge for repeat halftones. If not sending electronic artwork, send original photos only. FREE 24 Hour Service. Restrictions apply.